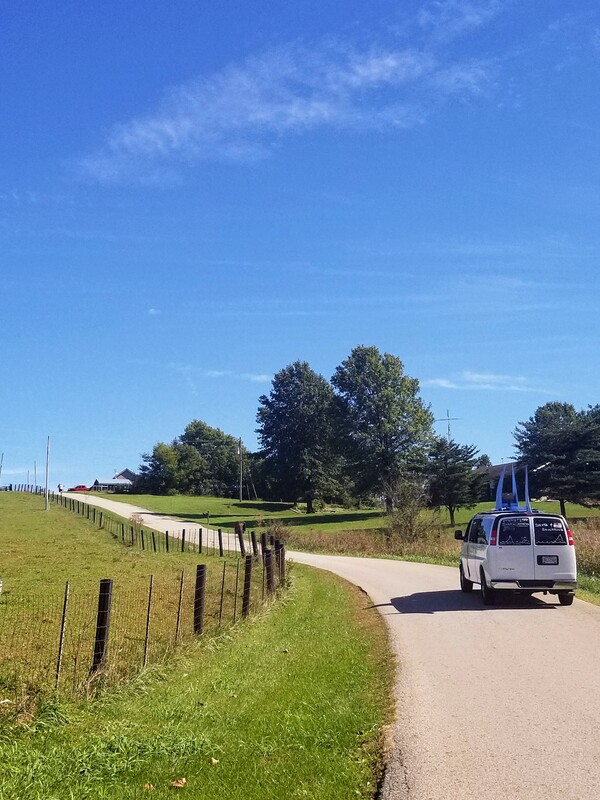 200 hilly gorgeous Kentucky miles. 6 runners. 1 van. This was the challenge that was pitched to me this spring. My immediate reply was an emphatic “no”. 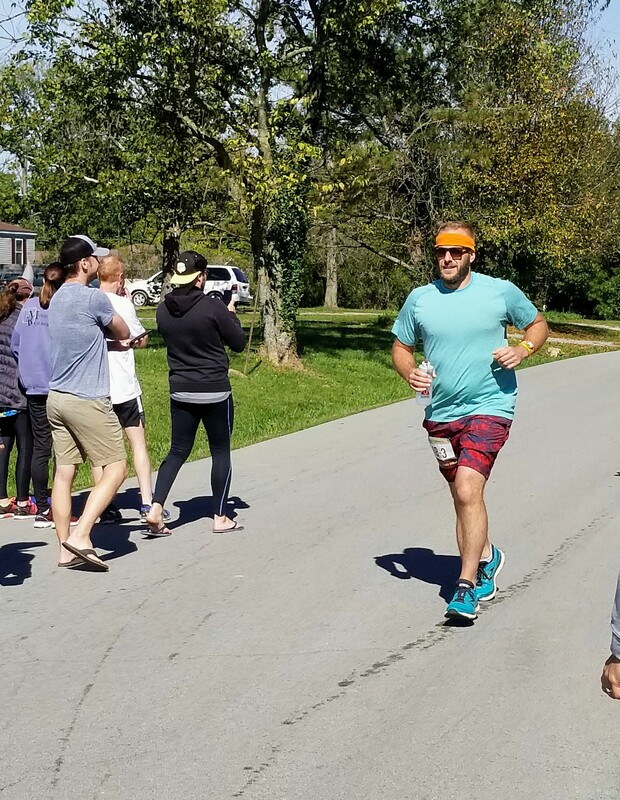 I had completed the Tennessee Ragnar Relay 3 times in the past with a full team of 12 runners. Those races had been challenging enough. 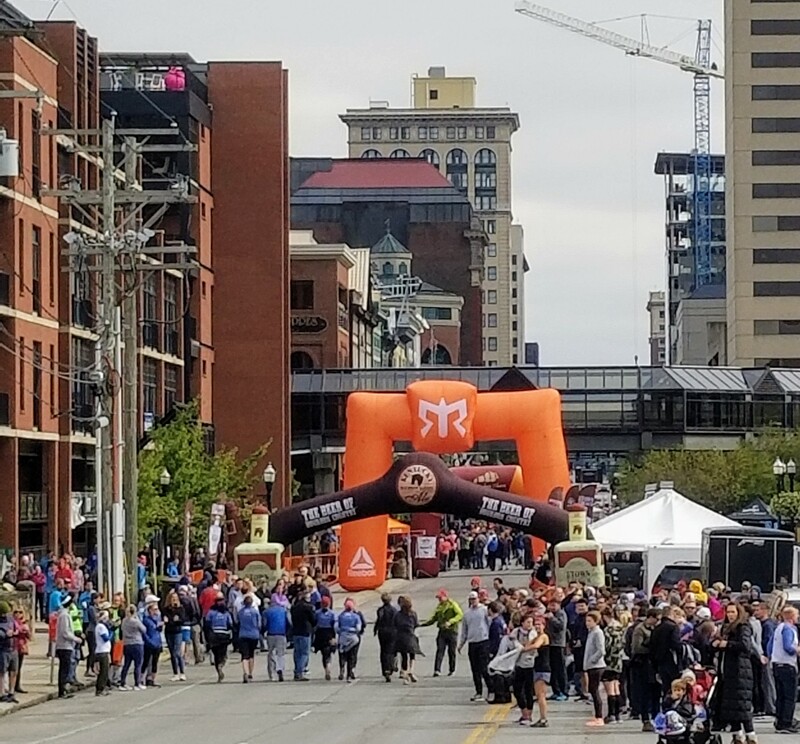 However my BRF (best running friend) was team captain and with some slight nudging I found myself 4 months later on a brisk October morning standing at the Bourbon Chase starting line, with only 5 other runners with me. 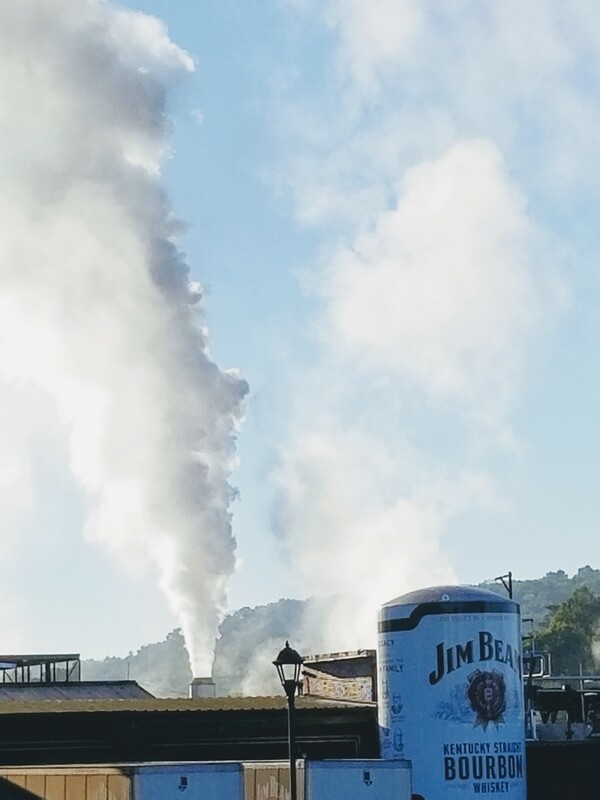 I zipped up my sweatshirt to ward off the chill and watched the fog drift over the Jim Bean Distillery as our runner 1 took off with the distinct smell of sweet mash filling the air. I still couldn’t really believe I was about to run 33 miles in the next 24 hours. Abby and I had trained hard. We knew the steep terrain, sleep deprivation and long miles were going to be a new level of challenge for us. She came up with a training plan that was a morphing of Hanson Marathon method with Ragnar training. It incorporated lots of hill work and then in the last month added in a day each week that included multiple runs a day. Every other week she had us doing hill sprints BEFORE our tempo run. This was one of the most evil running workouts I’ve ever tried, but I think it was super helpful to build the level of fitness we needed for this race. We drove up the night before the race so that we could be well rested for the start. However, between traffic, stopping for dinner and the time change we didn’t get to bed until after 11. We were up early for breakfast, coffee and the starting line. As we headed to the van, we could see our breath and immediately realized that the weatherman was liar. It was much colder than anticipated (i.e. packed for), so we dug out our sweat pants and ear warmers and drove to the Jim Bean Distillery where runner 1 took off at 8:30 a.m.
With a 12 person Ragnar team each person runs 3 “legs” of the race. The course is broken up into 36 segments. Where the runners hand off the baton (which is actually a slap bracelet with a chip in it) is called an exchange. With a 6 person “ultra” team, you can divide the legs however you want, we decided for logistic purposes to each run two legs at a time, so still running 3 times, but with longer segments. During Bourbon Chase we were all eating and running around the clock, so I had to eat strategically. We needed our normal amount of calories, plus calories to refuel from our runs (which varied from 8-16 miles) while making sure we had time to “digest” before our next leg. We were all running at different times, so we couldn’t really stop at restaurants. All food had to be taken with us in the van. We all had different plans. Abby had analyzed her caloric needs with the precision of a NASA scientist and planned accordingly. Mike brought no food and gambled on gas station cuisine. Myself I ate a combination of peanut butter sandwiches, bananas and protein bars. Pulling into Maker’s Mark Distillery was like arriving at a giant party. White Vans were lined up as far as you could as you could see and hip hop music floated across the shamrock green fields. This was a major exchange. If we had been a sane normal team on 12, this exchange is where the two vans would hand off; so there are twice as many people/ vans/ craziness at the major exchanges. One of my favorite vans had a “working” still on the top. I took in the sites and enjoyed ‘real’ bathrooms at Maker’s Mark as I waited for Eric to finish his leg. I was filled with nervous energy after a week of tapering and carb loading and 6 hours of watching my teammates run. Eric was all smiles when he rounded the corner. He finished with strong strides as he slapped me with the bracelet. I bolted off through through the property at Maker’s Mark and then out the country roads that surrounded it. Despite my best effort I did start out faster than planned, but the hills kept me humble. The course took me past farmland and country churches; up steep hills and winding roads. This leg was only 9 miles, so I didn’t bring water, but instead instructed my van to bring it me at the next exchange. Even though we didn’t change runners at every exchange, the van would meet up and check on the runner to make sure they were ok… at least this was the plan. As I neared exchange 8, I was feeling the heat and looking forward to my Gatorade; however, my van had taken a wrong turn and was MIA. I sent them a “gentle reminder text” that I would be needing fuel and headed on to exchange 9. One of my favorite parts of running an ultra was the “in between” exchanges. When you are running 2 legs in a row, you simply pass through the first chute and say ” Ultra team” so the person working the booth doesn’t try to find your team mate. As I passed through the chute the other runners would whisper in awe “look it’s an Ultra runner”, while cheering you on and shaking their heads in disbelief at your craziness (and/or they were checking their phones). It was completely beast mode*. My team caught up with me around mile 8 and I was able to get some much needed nutrition. The route was challenging, but the views gorgeous and reminded me of the back roads of Oregon County, Missouri where I am originally from. While not all the routes where overly scenic (Jeff had to run 16 miles along a major 4 lane road), everyone’s first legs went well. A couple of wrong turns (we also missed Jim at his exchange) and some forgotten glide, but overall everyone’s first legs were successful. Eric coming into the exchange. Run 2 was my night run. 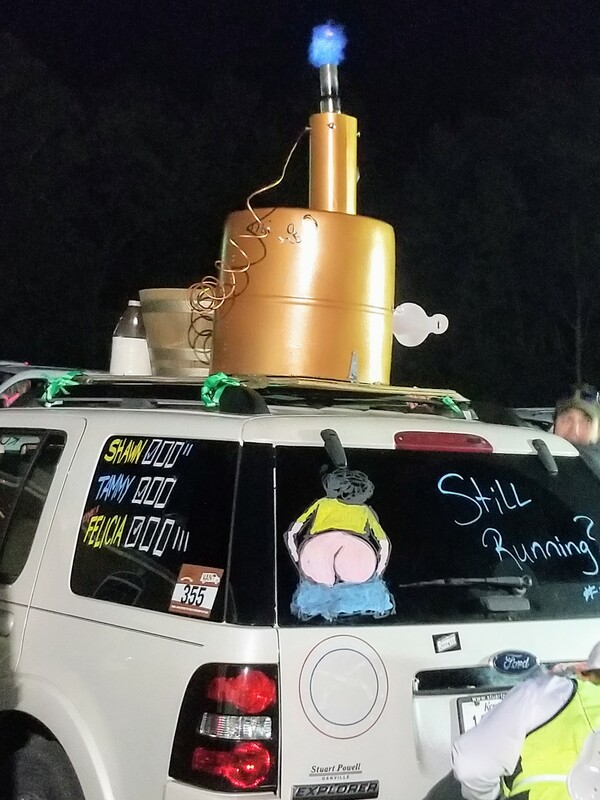 This is where the whole Ragnar thing gets a little tricky . 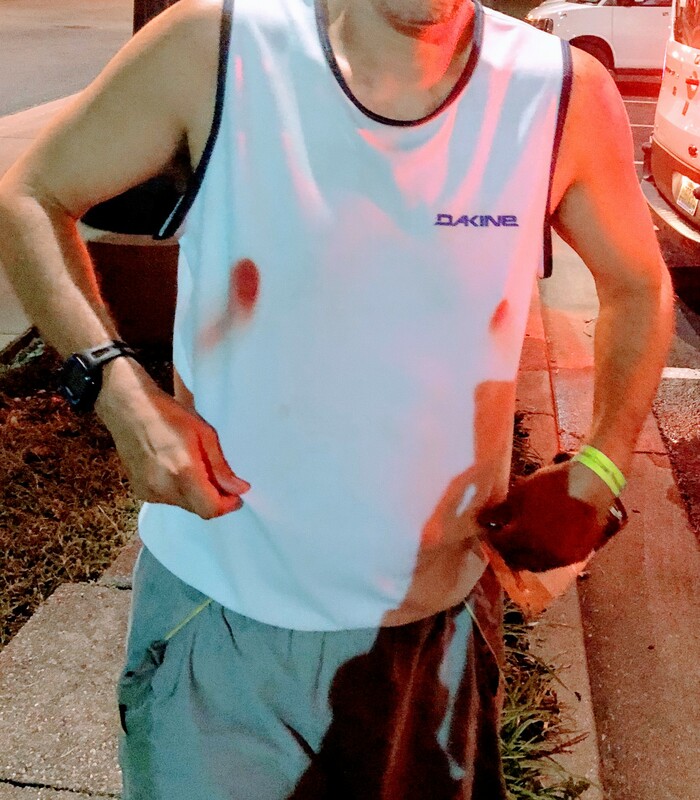 It’s all fun and exciting when you are running at 2 in the afternoon through beautiful farmlands, but 10 miles at 2 am…. that is its own challenge. In Ragnar’s past I have found myself on rural country roads, where it was simply me, my head lamp and the moon. When the shadows start playing tricks on you and the car coming toward you starts to swerve a bit; it becomes a complete mental game not to lose your cool. 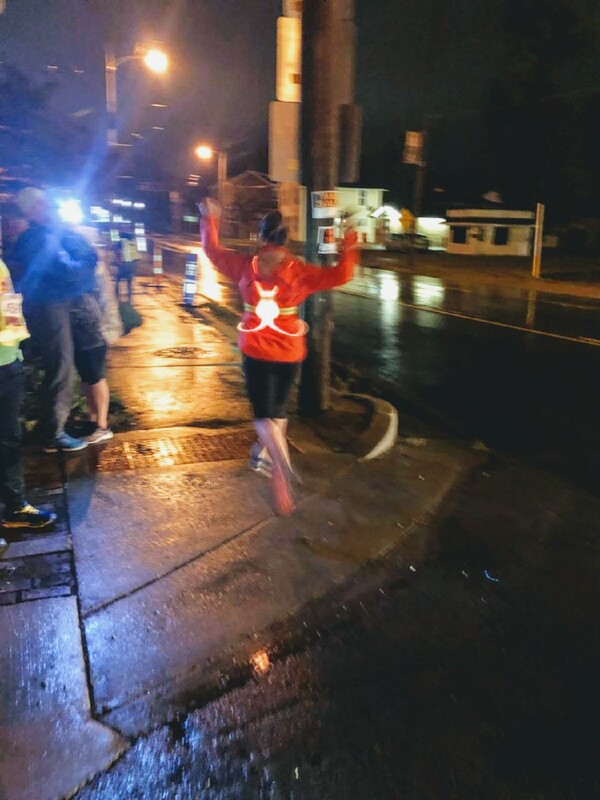 This year’s night run was not remote, but its challenge (in addition to the exhaustion and dark) was cold pouring rain, even though the weather man had not mentioned precipitation in the 2 million times I had checked the weather the week before. As I waited for my teammate in the chute, shivering in the rain, I began doubting my running choices for the first time this race. When I finally took off, the pelting rain and wind were completely miserable, but after a few miles I warmed up. The feeling slowly returned to my frozen hands and I fell into the familiar cadence of my run. The route was beside a major highway, so another challenge was dodging roadkill (I’ve never seen so many dead raccoons in my life). This leg was physically and mentally exhausting, but I stuck with the mantra of “only run the mile you are in”, so after 10 “individual miles” I gladly passed the bracelet to Jeff, changed into warm clothes and curled up in the van. After my night run I drifted in and out of sleep. After my legs, the rest of the night exchanges were a blur. Each time the my body finally relaxed enough to drift to sleep, we would stop and the slamming of doors and rush of cold air would would once again startle me awake. 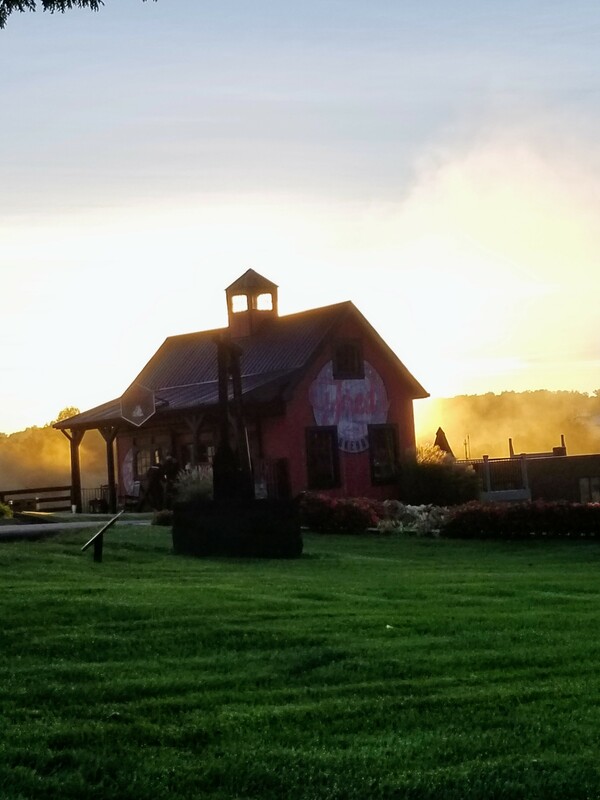 At the Four Roses Distillery exchange, I awoke to the beautiful smell of my teammates eating hot fresh donuts. Jeff and I had slept through their initial exit of the van, but they kept remarking on the magnificence of their pastry creations, so Jeff and I decided we had to have some as well. The (free!) donuts were being made in a food truck that was a 10 minute walk up a hill, which feels like quite the trek at 4 am and on tired legs. But alas, we made it and grabbed some soul warming hot chocolate as we waited in line and debated which donut delicacy we would order (bourbon bacon perhaps?). As we approached the window to order, the line stalled out. We soon discovered much to our rumbling tummy’s dismay, they had run out of donuts and would have to make some more. There is no level of disappointment akin to that of an exhausted runner denied a donut at 4 am after already running 19 miles. But alas, somehow I dug deep and was able to overcome this adversity, because that’s just the sort of strong woman that I am. 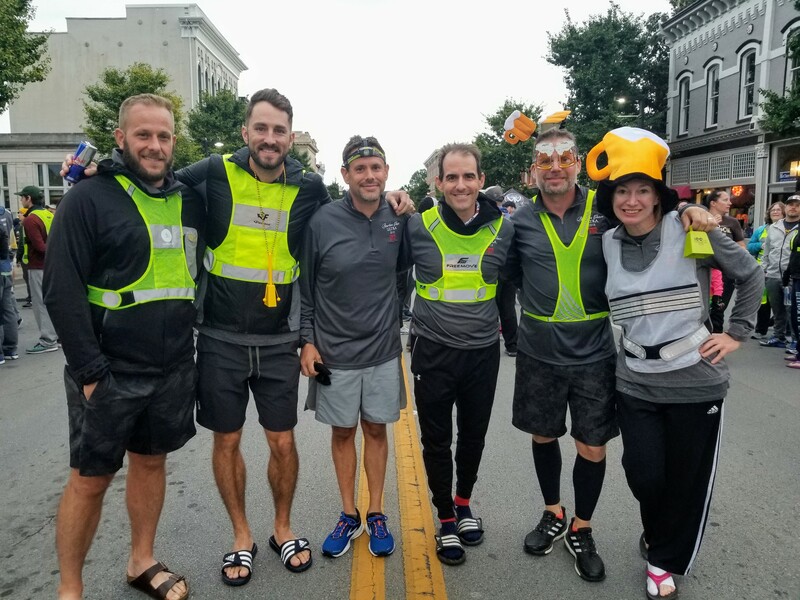 I have run the Tennessee Ragnar 3 times and it was always an awesome experience, but the towns of Kentucky embraced the Bourbon Chase and its runner with a level of hospitality that was truly amazing. The people of Stanford, Kentucky opened up a couple town down shops at midnight to let the frozen, exhausted runners use their bathrooms. After 16 hours of using porta potties, there are few things as beautiful as sparking clean, flushing, real porcelain toilets. They also gave out FREE homemade baked goods, coffee and cocoa. Thank you to the volunteers who stayed up all night feeding tired stinky runners. Your kindness was appreciated. 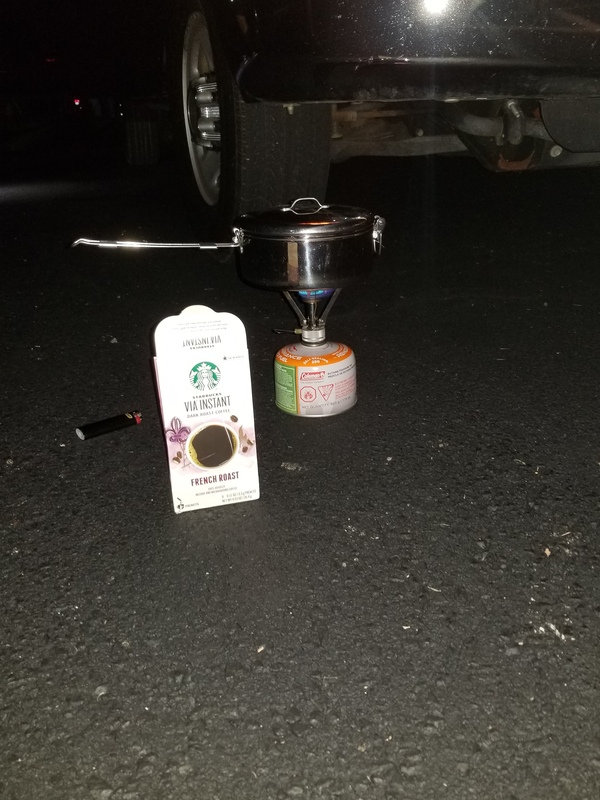 Eric brought a camp stove so we could have (hot!) coffee at 3 a.m. It was the most delicious instant coffee I’ve ever tasted. I think everyone struggled a bit on the night runs, but no one complained. We all fought the demons of exhaustion, tired legs and fear to come out victorious. Sure we may have lost one runner (so sorry Jeff about exchange 23!) but we ran all the miles and survived the night. One big difference between running with women and men is the smell. When women finish their run, they quickly clean up (I used epic wipes) and change into fresh clean clothes immediately. Then they carefully secure their sweaty clothes in a large ziplock bag complete with a fabric softener for further odor control. Men sometimes change out of their sweaty shirts in a couple hours and then toss them on the floor (only slight exaggeration involved). Luckily, I do not have a very keen sense of smell, because our van had had quite the STANK. Another difference between running with men and women… glide is a MUST. On minimal sleep, lots of coffee and tired legs I set off on my last and longest run. 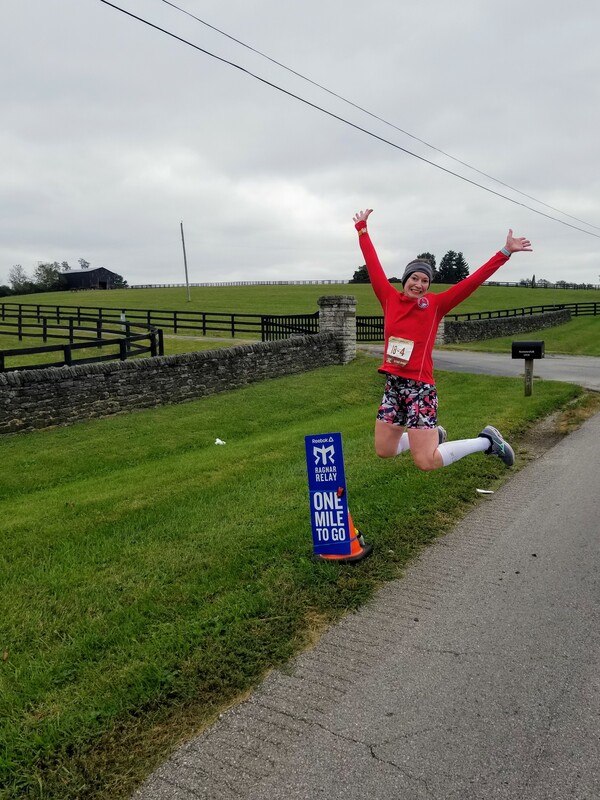 I started out in a suburban setting, but quickly found myself running through the rolling hills and million dollar horse farms that make Kentucky famous. The first several miles of road were lined with stone fences and antebellum trees. The weather was cool and overcast, not great for photos, but perfect for running. I marveled at the massive barns that resembled mansions (one looked exactly like Brentwood Baptist Church) The horses pranced on perfectly manicured pastures sometimes coming to the fence, curious of the strange slow creatures who only ran on two feet. My IT band began to hurt on and off around mile 7, not enough to stop, but enough to slow me down a bit, especially on the vicious hills. By mile 10 I was ready to be done, no amount of scenery could soothe the ache in my leg. I ran with another runner the last 2 miles which helped distract me from my overall misery and when I saw my final “one mile left” sign I was ecstatic. As if to pour salt on my already aching wound, the final half mile was straight up one last ridiculous hill. I gave that last mile all I had left and with jubilation I slapped that bracelet on Jeff’s wrist and I WAS DONE. We approached Lexington and finished the race together 31 hours after we started. Downtown Lexington was blocked off for the after party. After sampling some free bourbon, we ate our weight in pizza; took the world’s longest, hottest shower and slept the best sleep of our lives. 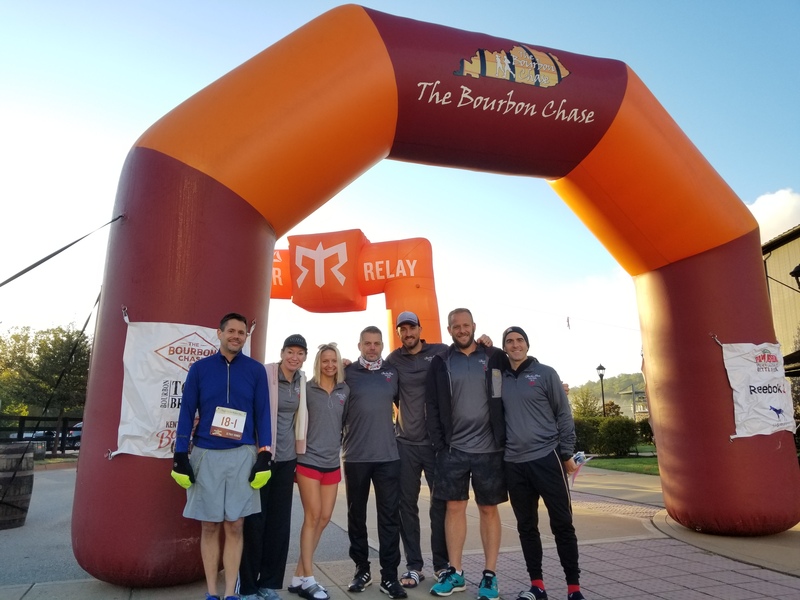 The Bourbon Chase volunteers were top notch and the race felt extremely well organized. Our captain Abby was also an amazing leader, organizer and overall wonderful person and without her it would not have been such a great experience. It was also extremely helpful to have a driver so that when we weren’t running, we could a whiff of rest. Ben was so generous stay up all night driving us around in a stinky van (although he did get donuts and I didn’t… not that I’m still bitter about that or anything). Seriously, Ben we can not thank you enough. 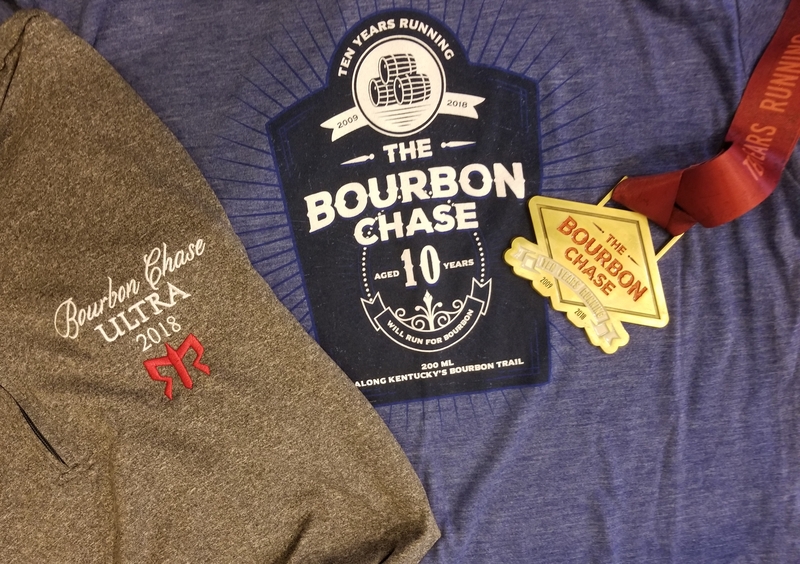 Looking back on the entire Bourbon Chase Ultra experience it was definitely the most physically challenging race I have ever done, but also the most rewarding. The training and the race required hard work, but so do most of the best parts of life. There is just something about pushing your body to its limits and coming out victorious. 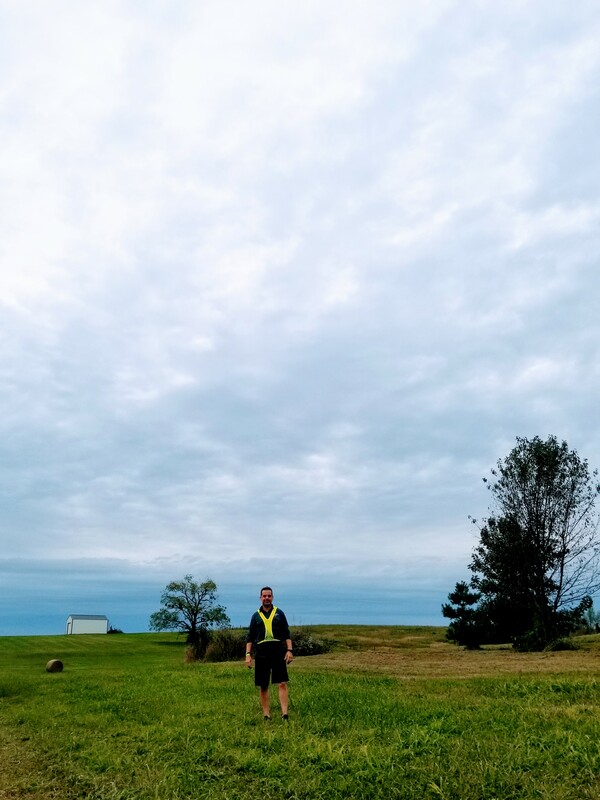 We chose the “Van less traveled by**” and that my running friends, has made all the difference. *beast mode refers to a state of performing something, especially difficult activities, with extreme power, skill, or determination. Also, an obnoxious term used by middle aged suburban athletes to make them feel better about their athletic ability. Jim at one of the many picturesque exchanges. 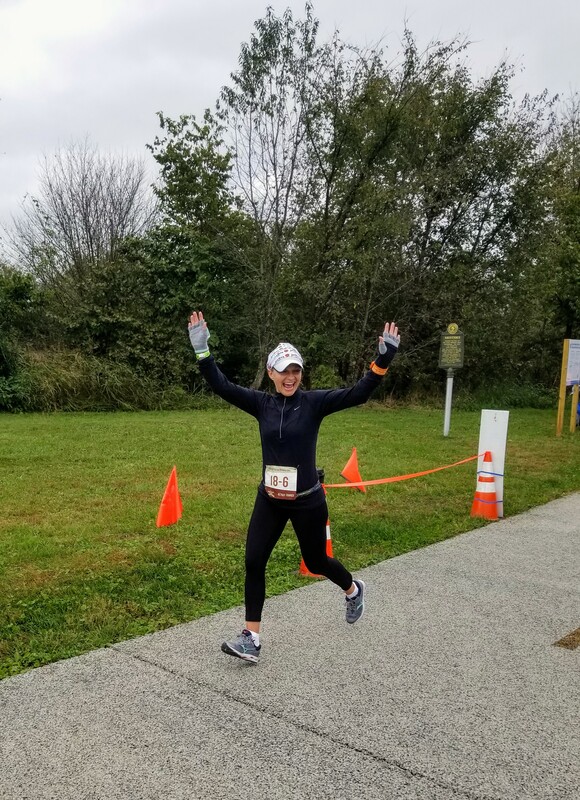 This entry was posted in Running and tagged Bourbon Chase, Bourbon Chase Ultra, Ragnar, Ragnar Ultra on October 28, 2018 by drrupe. Can you please blog more? This is the best and of course you are hilarious.